I had intended to write this entry around Mother’s Day but then life happened and got in the way of my good intentions. 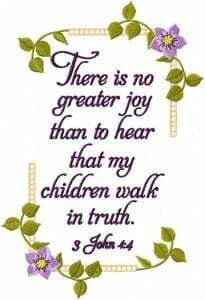 As I am working on a design with the scripture “There is no greater joy than to hear that your children walk in the truth” (3 John1:4) my heart is filled with thankfulness that this is true of my two children today. It wasn’t always that way. There were years of deep pain and sorrow over the path our daughter had chosen. But those days, thank God, are in the past and it is with great thankfulness today that I would like to share with you Kristy’s story in her own words. I am posting this story as an encouragement to those who might have children who have chosen a path that seems self-destructive. 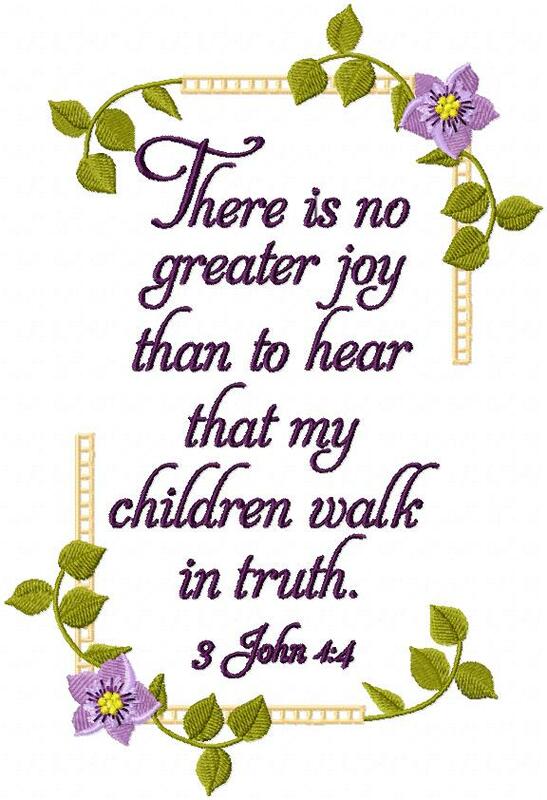 I want to encourage you to give that child to the Lord; He does care and He does hear your prayers. May Kristy’s story be an encouragement to you. Kristy Brock testimony from Jeffrey D. Brock on Vimeo.